Knight of Cups follows writer Rick (Christian Bale, The Fighter, American Hustle) on an odyssey through the playgrounds of Los Angeles and Las Vegas as he undertakes a search for love and self. Even as he moves through a desire-laden landscape of mansions, resorts, beaches and clubs, Rick grapples over complicated relationships with his brother (Wes Bentley) and father (Brian Dennehy). His quest to break the spell of his disenchantment takes him on a series of adventures with six alluring women: rebellious Della (Imogen Poots); his physician ex-wife, Nancy (Cate Blanchett); a serene model Helen (Freida Pinto); a woman he wronged in the past Elizabeth (Natalie Portman); a spirited, playful stripper Karen (Teresa Palmer); and an innocent Isabel (Isabel Lucas), who helps him see a way forward. Rick moves in a daze through a strange and overwhelming dreamscape — but can he wake up to the beauty, humanity and rhythms of life around him? The deeper he searches, the more the journey becomes his destination. The 7th film from director Terrence Malick (The Thin Red Line, Tree of Life), Knight of Cups (the title refers to the Tarot card depicting a romantic adventurer guided by his emotions) offers both a vision of modern life and an intensely personal experience of memory, family, and love. Knight of Cups is produced by Nicolas Gonda, Sarah Green and Ken Kao. Prominent crew includes cinematographer Emmanuel Lubezki (Gravity, Birdman), production designer Jack Fisk, costume designer Jacqueline West, and composer Hanan Townshend (To The Wonder). The film’s ensemble cast also includes Antonio Banderas, Cherry Jones and Armin Mueller-Stahl. 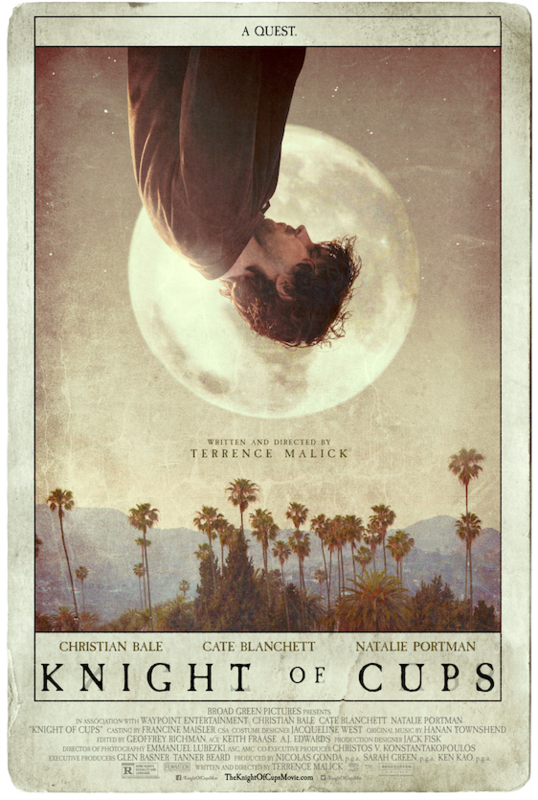 ‘Knight of Cups’ Trailer Is A Treat For The Senses!!! This entry was posted on Wednesday, January 27th, 2016 at 12:21 pm	and is filed under Film, News. You can follow any responses to this entry through the RSS 2.0 feed. You can skip to the end and leave a response. Pinging is currently not allowed. « A mix between ‘The Shining’ and Chickens is ‘The Chickening’!